Parker Bioscience Filtration has enhanced its manufacturing capabilities with the launch of a new ISO class 7 cleanroom facility at its site in Birtley, UK. 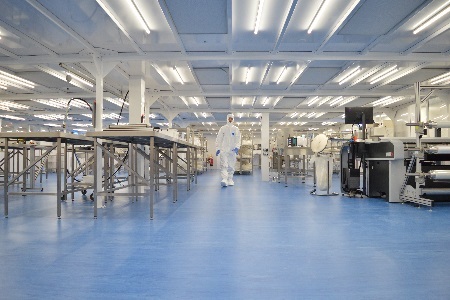 The cleanroom, which opened this month, forms part of a major phased investment programme at the Birtley site and will be dedicated to the manufacture of single-use assemblies used in biopharmaceutical manufacturing. The assemblies are supplied to customers fully assembled and pre-irradiated ready for direct use in their cleanroom facilities in the manufacture of drug products. In tandem with the launch of the new cleanroom, the Birtley site will see the introduction of a new manufacturing area for single-use sensing technologies used in biopharmaceutical manufacturing. These allow users to monitor key process parameters such as temperature, pressure and conductivity. Parker Bioscience Filtration is part of Parker Hannifin, the world's leading diversified manufacturer of motion and control technologies and systems. It designs, supplies and delivers whole systems for both upstream and downstream pharmaceutical and biopharmaceutical manufacturing. With another manufacturing site Oxnard, California, Parker Bioscience Filtration supports companies in improving process control, efficiency and security throughout their production and packaging processes, and provides integrated bioprocessing solutions that speed up development times, increase efficiency and safety, and enable reproducible quality. Incorporating SciLog® and domnick hunter, Parker Bioscience Filtration combines filtration, single-use fluid-handling systems and sensors into automated single-use solutions. The new 600 m2 cleanroom will not only complement the existing cleanroom facilities but also provide additional manufacturing capacity for single-use technologies at the UK site, which already has 2400 m2 of cleanroom facilities dedicated to the manufacture of filtration products and the manufacture of single-use assemblies. The new cleanroom, which will be completely dedicated to the manufacture of single-use assemblies, significantly strengthens the Parker Bioscience Filtration’s ability to serve biopharmaceutical manufacturers in the European market and complements existing single-use assembly manufacturing operations in the United States. Once completed, the overall investment will also see an expansion of Parker Bioscience Filtration’s laboratory, office and warehouse facilities, and will make the Birtley premises one of the most modern manufacturing sites for integrated bioprocessing solutions in EMEA. Commenting on the opening of the new cleanroom, Mike Brailsford, General Manager at Parker Bioscience Filtration, said: “The opening of a new ISO Class 7 cleanroom in Birtley will shorten the supply chain for our global customers and enhance our ability to meet growing market demand for single-use assemblies in the biopharmaceutical manufacturing sector. The new ISO class 7 cleanroom facility at Parker Bioscience Filtration’s site at Birtley, UK. Parker Hannifin is a Fortune 250 global leader in motion and control technologies. For 100 years the company has engineered the success of its customers in a wide range of diversified industrial and aerospace markets. For more information, visit www.parker.com or @parkerhannifin.